It is a well-known stronghold for the Ballas gang. The history of the area is unknown, although it is possible that the Grove Street Families controlled the area at one point, as Emmet, a Seville Boulevard Family gang member, lives in Willowfield. The area is also very large, and can be described as a low-income district, with poorly-built houses. It also has numerous businesses. It can be also described as an industrial district, as there are many industrial structures and places here, especially southern Willowfield. In Grand Theft Auto: San Andreas, the Rollin Heights Ballas, a subset of the Ballas, use Willowfield as a base from which to attack both Ganton and Playa del Seville, both Grove Street Families territory. Carl Johnson enters Willowfield rarely during the storyline; some instances are for weapons, to modify low riders, and to perform drive-by shootings on Ballas gang members. 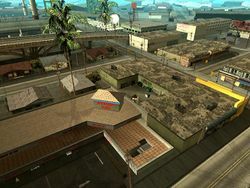 Depending on the player's actions, Willowfield can be captured and claimed as a territory of the Grove Street Families. Carl Johnson's home in Willowfield, as depicted in Grand Theft Auto: San Andreas. This page was last modified on 6 December 2012, at 08:06.